Release. – The Best Part of Caring – Northern Rivers Wildlife Carers Inc. When release day comes round I always have a great feeling of apprehension. Are they ready? Have I done all I can to prepare them for life in the wild? Will they survive out there? Once they are out though, and you see them flying, hopping or climbing about, it’s a great feeling as they enjoy all their new experiences. We hope that all our hand-raised animals go on to live long lives in the wild but realistically some may not. It’s so rewarding when you see them surviving months or years after release. With adult animals that have been in care because of sickness or injury it’s even better. You know that they have already been surviving well before the misadventure that brought them into care and they almost leap out of the container to get away from you at release. Once released hand-raised animals often require support feeding, some for longer than others. I’ve had Tawny Frogmouths that I raised come back for a nightly feed for up to six weeks and other times like last year when they returned only for a week. I do not know why this is so, possible reasons may be food availability, weather or some other factor. 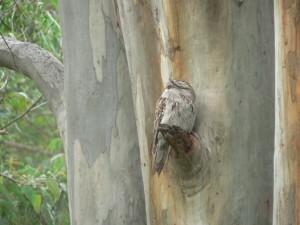 In early May I had a Tawny come onto my verandah railing several nights in a row. It would fly off when I went out but on the fourth morning it was still sitting there up against the wall. – At the same spot my hand-raised Tawnys would sometimes roost during the day. On dusk I went out with some food and he became very excited and took quite a lot. Obviously he was one that I had released in January. Perhaps with the onset of cold weather food out there was a bit scarce but he certainly seemed well. He came every night for around two weeks and would roost on a small piece of broken branch on the gum next to our verandah. 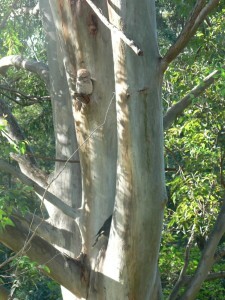 He was well camouflaged and was only disturbed when a Currawong would go around clearing all the bark from the forks of the tree looking for insects. He then only came the odd night and finally I’m not seeing him at all. What a clever Tawny to remember where to get a free feed! The swamp wallaby pictured is one of the first I raised and released. 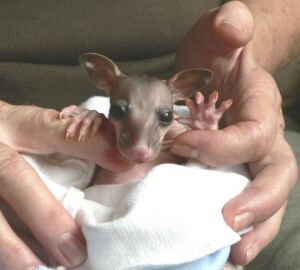 She came into care as a joey when her mother was hit and killed by a car. I let her out of the pen in 2008 and she always comes back at the stage her joey is starting to get out of her pouch, she must feel it’s a safe spot. 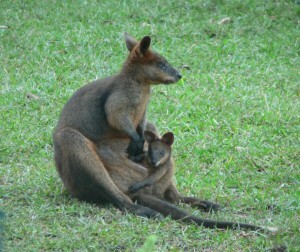 I feel very pleased seeing her as not only was her life saved but she has produced five very healthy joeys. Times like these help you forget the sad experiences we all have at times with wildlife caring.